You can now pay your utility bill with a credit or debit card. 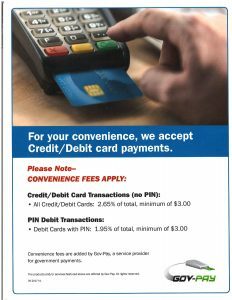 You can make your payment in-person at the Hazleton City Hall, by calling (319) 636-2559 or online at https://govpay.net/hazleton-ia-utility. Bingo at the American Legion Hall every Thursday, 6:30 PM – 10:00 PM. Call 319 636-2559 for more details. The Hazleton Commercial Club meets at 7:00 PM on the first Wednesday of each month in the Hazleton American Legion Hall. The Hazleton City Council meets at 7:00 PM on the third Wednesday of each month in the Hazleton City Hall.